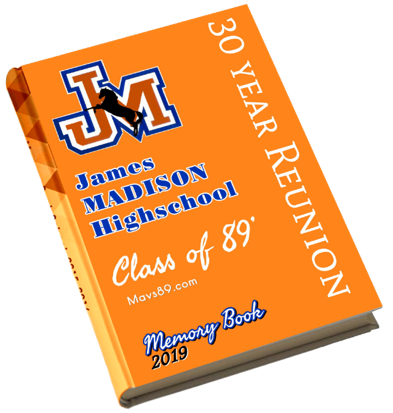 Want to have all your favorite high school and reunion memories all in one keepsake book? Do you own a business or are a business leader in your industry and want to get the word out to your classmates? Want to see what all your old friends have been up to all these years? Dear Class of 89 Alumni. As you are probably already aware, on June 21st - 22nd, we plan on holding our 30 Year Class Reunion. The Reunion events promise to be filled with a lot of fun, laughter, catching-up, and friendship. We know this will be a very memorable event that you will not want to miss. The Committee has done a fantastic job with securing the venues, food & drinks, and the entertainment for those dates. We have also tried to elevate the experience over the previous 10- and 20-Year Reunions; while keeping the price to only $75 a person. During the planning of the 30 Year Reunion, the Committee discussed many additional opportunities to elevate the event’s experience. One of those opportunities was to create a 30 Year Reunion Memory Book to be given free to all 89 Alumni. The Memory Book will be a collaborative effort that promises to be fun and engaging. It will highlight Alumnis’ shared photos from our time in high school, the 10 Year Reunion, the 20 Year Reunion, an In-Memory Section for the Mavs we have lost over the years, and a section for Alumni Business Owners & Business Leaders. It will definitely be a great conversation piece during the Reunion and a keepsake to look through for many years to follow. So, this is where you, a possible Class of 89 Alumni Business Owner or Business Leader comes into play. We are actively seeking Sponsors who would like to help with the financial aspect of the 30 Year Reunion Memory Book with a $100.00 Business Sponsorship. For your kind sponsorship, you will have your business card displayed in the Memory Book letting everyone know who you are, what you do, and how to contact you. We see it as a wonderful chance to let your fellow Mavs know what you do for a living and your generosity. Besides, once your fellow Mavs know what you do; who better to give their business to, then to a fellow Mav. Now, this will be a time sensitive opportunity. We would like to have a head count on who would like to participate by April 7th. If the response is not there, then we will probably just shelve the idea. However, I do not believe the Class of 89 Alumni will let that happen. So, if you own a business, you are a leader in your industry, or you know of another Class of 89 Alumni that is, please contact me as soon as possible. The deadline is April 7th.